I know I have been promoting my KICKSTARTER a lot these past few days. But, I actually have even more awesome KICKSTARTER related matters to share! 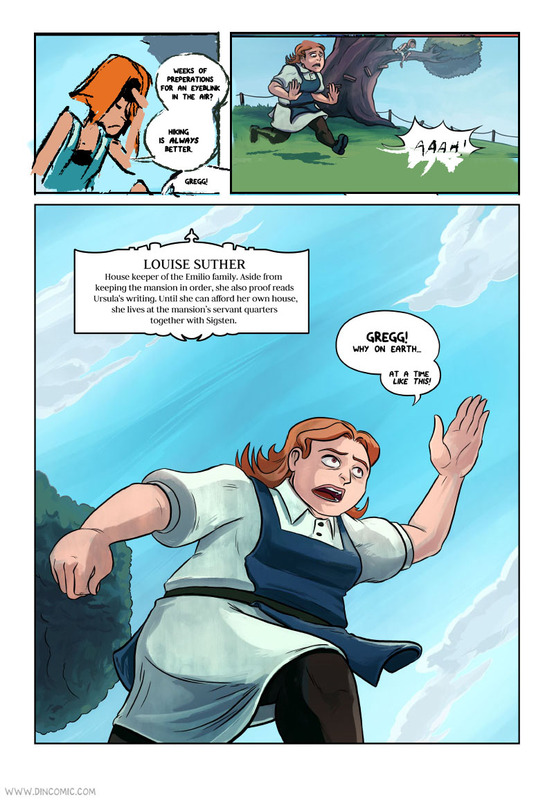 A fellow Swedish comic artist, Andreas Qassim, is currently also running a KICKSTARTER to fund the creation of two longer stories of The Pacifiers. It's a comic project with quite a unique outline. The main cast are toddlers who posess the power to transform into Rambo-like muscle babies and they fight bad guys by shoving pacifiers into their mouths! Check it out! I think it looks amazing and far from something I've seen before. Would be great to see where Andreas Qassim and his crew (Jimmy Wallin & Alfred Beckman) can take this concept when it gets funded! 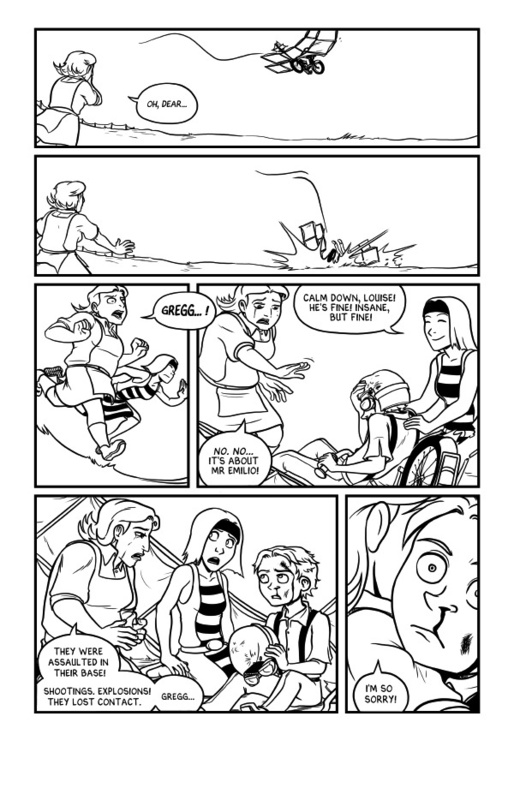 If you are curious about what the comic looks like, there is currently already one story up at the website http://www.pacifierscomic.com/ ! 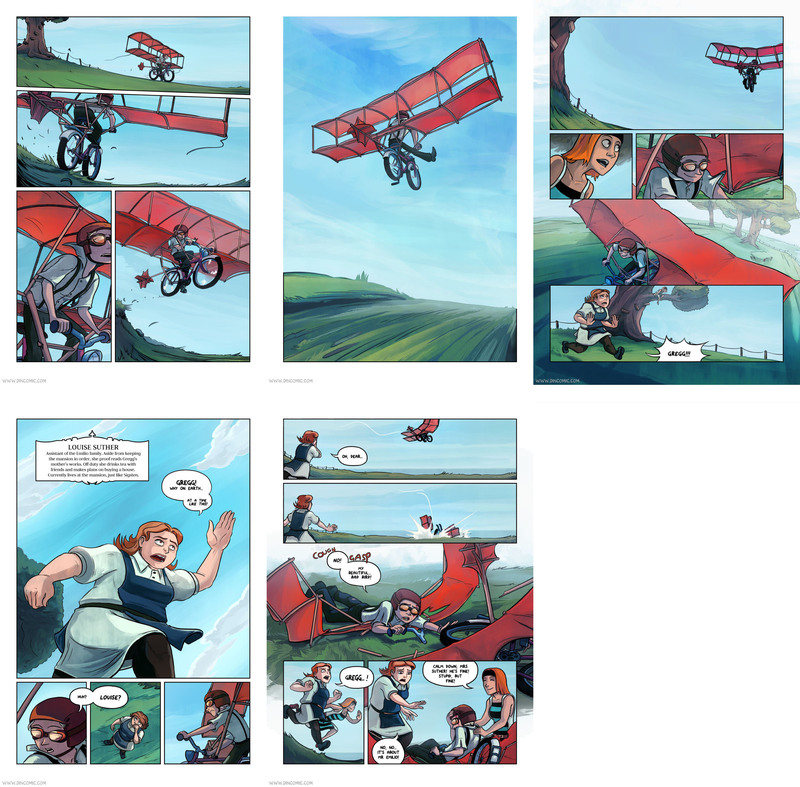 The new feed shows comic page previews and also the blog posts. Which is awesome! The old feed doesn't show anything anymore, so... it's a bummer to stick with that one, right? In this kickstarter I am raising money to fund the printing of the Chapter 2 book of The Din! Here's the map of the convention! In other news, I am going to have a table at the Stockholm International Comics Festival this come weekend! Double wohoo! If you're in Sweden and would to see me, get a freebie-comic of the Prologue and look at the first proof copy of the Chapter 2 book - make sure to stop by! My hair looks a bit like... a My Little Pony right now. 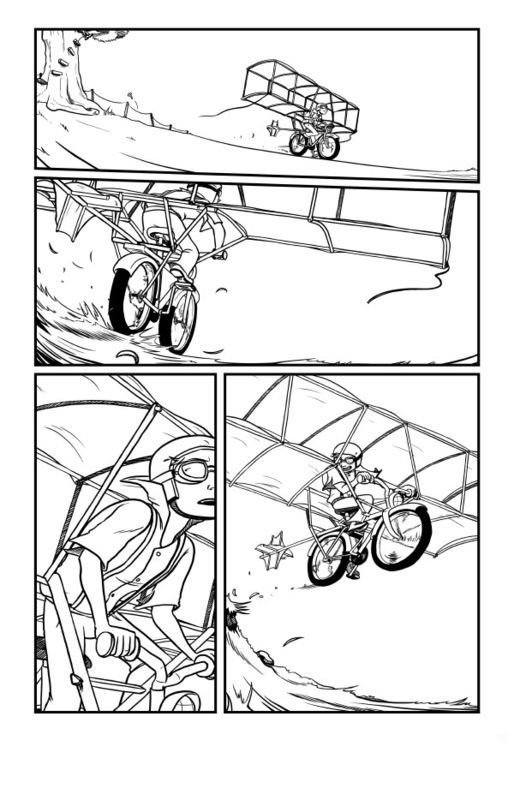 The Revisions of The Crashing/Flying Scene! 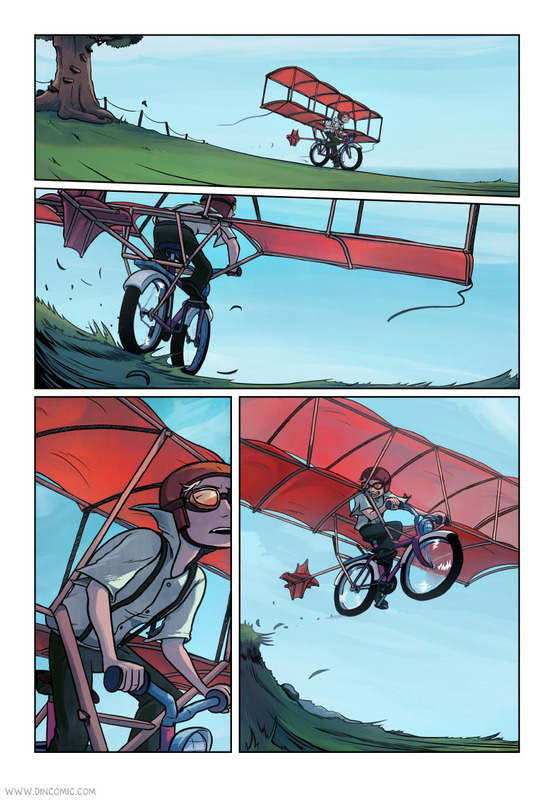 As promised, here's a breakdown of the revisions the Bike Glider Flying/Crashing Scene went through! Some of you gave me some much needed input about this scene before it started to unfold. Just so you know; I am thankful for every thought and analysis regarding this scene, it helped me make it much better. I know what I have now is not 100% realistic, but I think it serve's its purpose (to be dramatic, fun and comical). I hope you think so too! 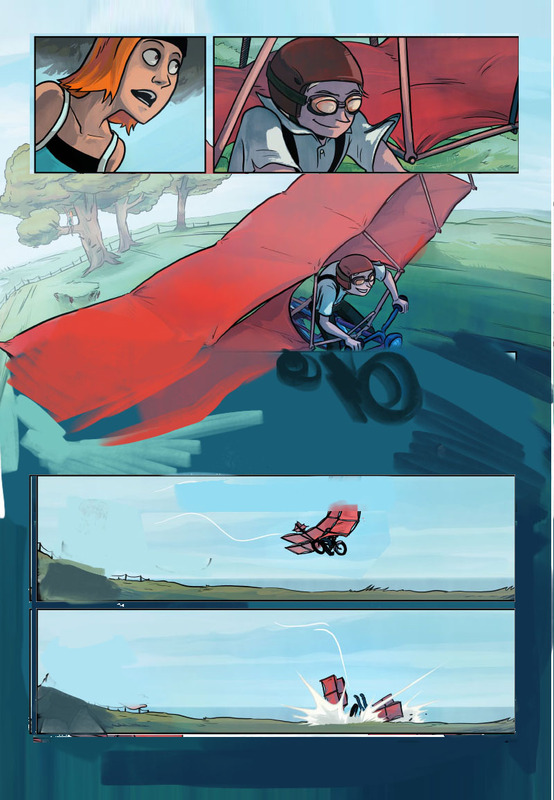 Anyway, so about this flying/crashing scene of Chapter 2! It's undergone a lot of revisions the past years, and I will share the major ones. 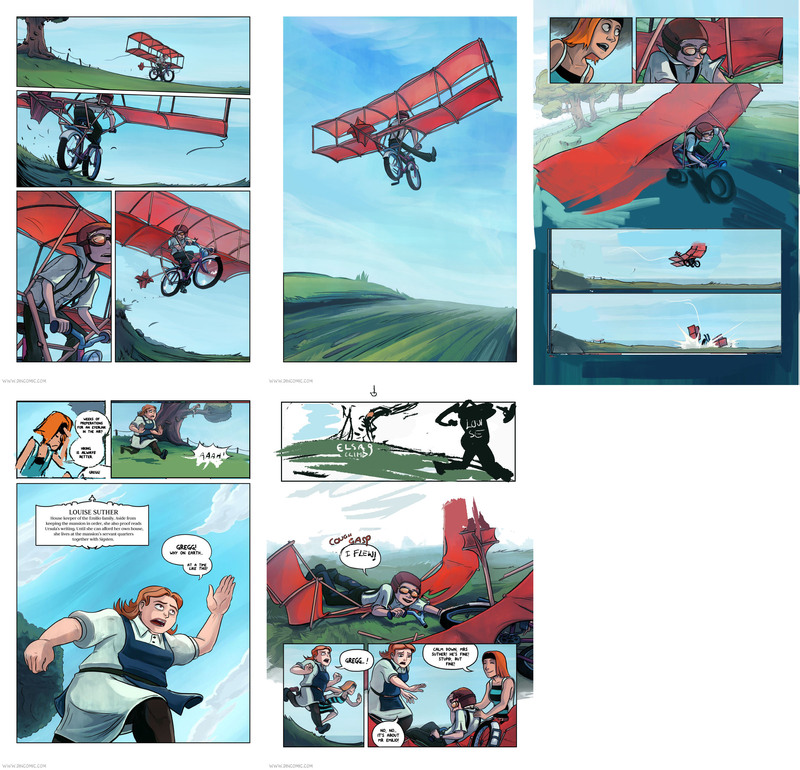 The first one being the old test-version of the comic, when none of the pages had color (drawn in 2012-2013). The scene was short and snappy! Most of the scenes were, because the chapters were much shorter back then. My proof readers told me that making the scene a bit longer wouldn't hurt. 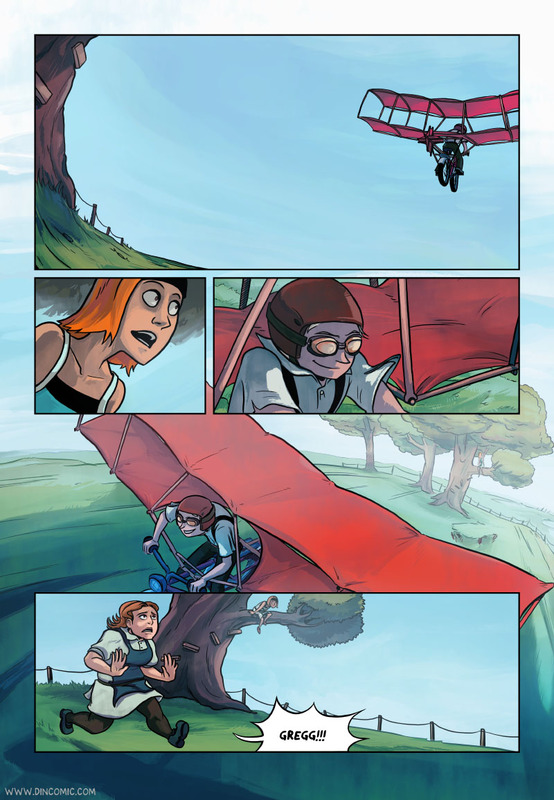 It's a happy moment to flight-test an invention, especially one that is more advanced than a kite. It was a bit of a disappointment that it ended so abruptly. So I went ahead and added a splash page to make the scene longer. 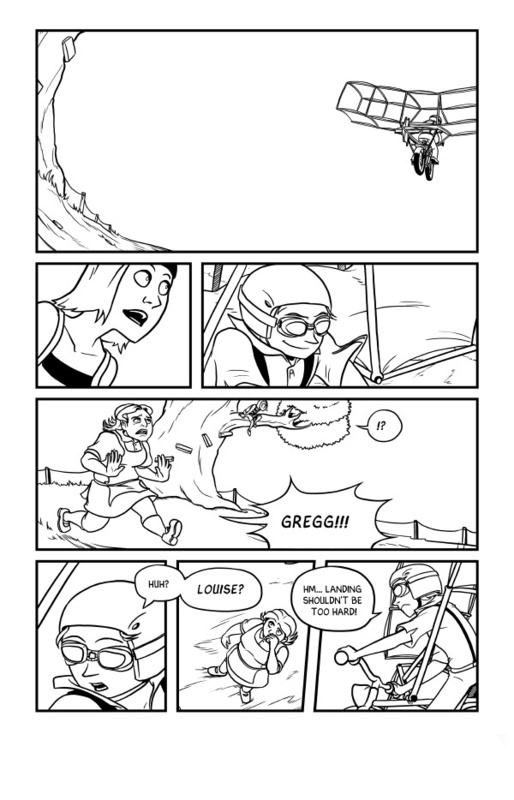 I also added an extra panel where Gregg is grinning like mad in the air. 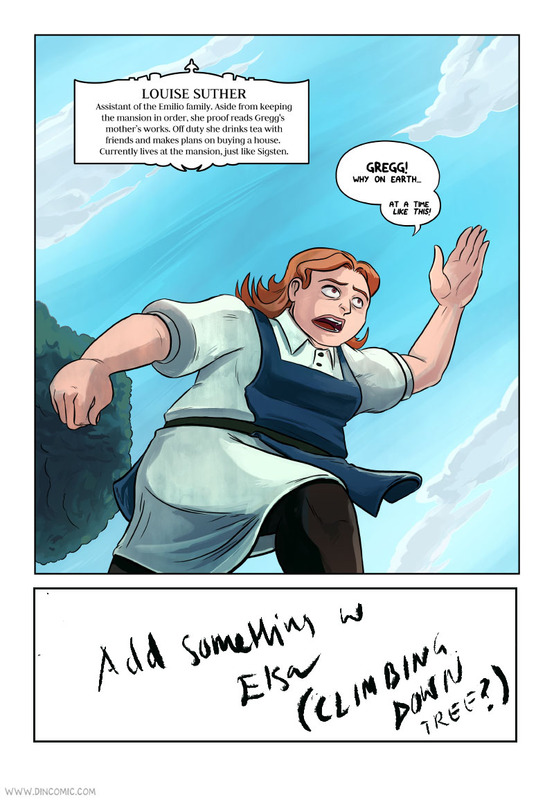 An other reason to make these adjustments was that the comic was in need of more lighthearted stuff. This is what I had planned to post before I read the speculations regarding how well (or how bad!) 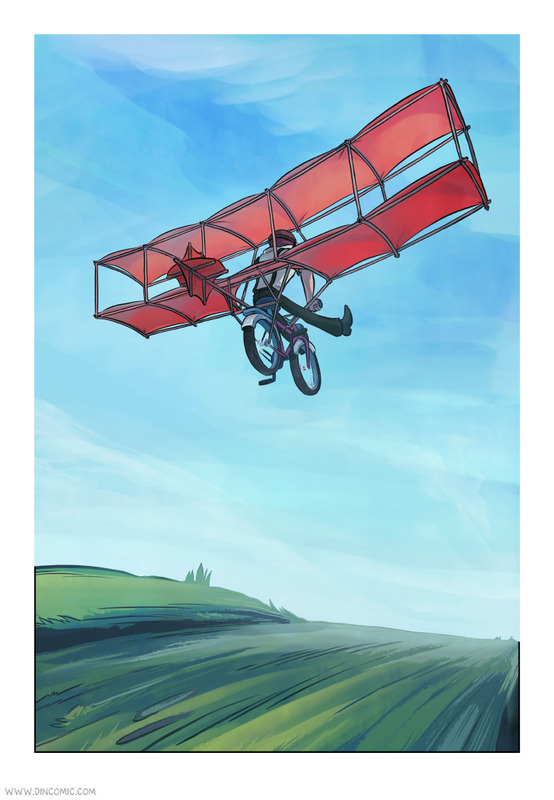 the bike glider theoretically would fly. 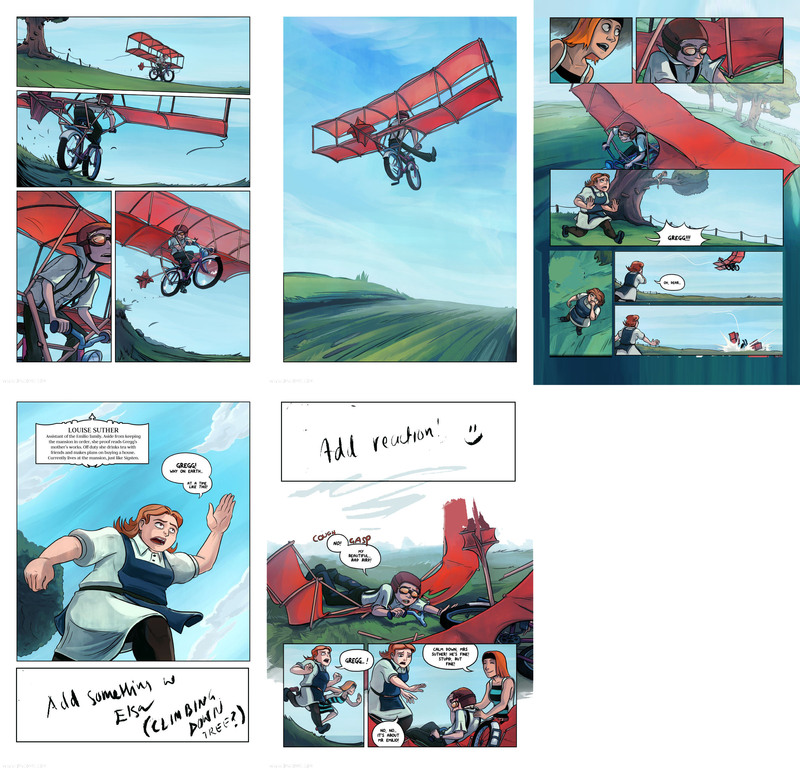 I quickly realized the version I had planned out wouldn't fly (yay, pun)! Got some feedback and new ideas on how to make it even better. 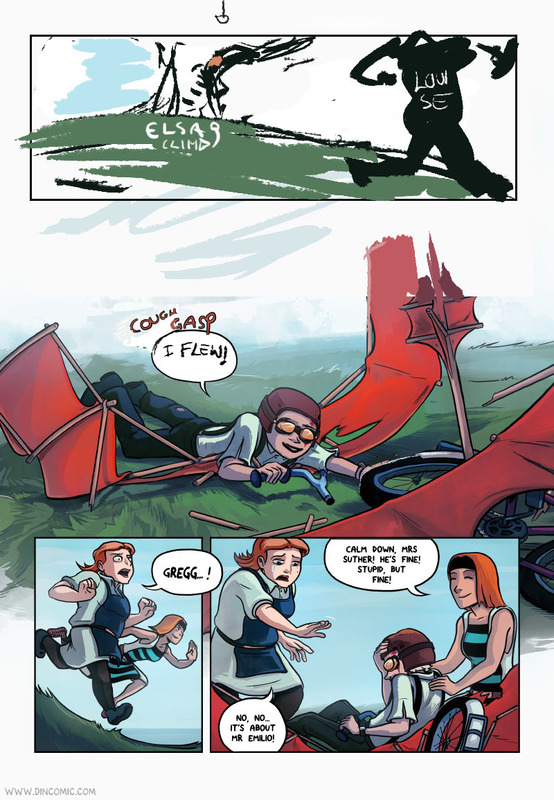 Removed some more unnecessary panels, flipped the flying middle panel and added a disappointed Elsa. Thanks for reading and thanks everyone for the input! :3 I truly mean it! Your input made me push this scene further, and for that I am grateful! Onward to the next challenges! Hi everyone! An other announcement! It's main purpose is to print a batch of Chapter 2 books. But you will also be able to get your hands on the Chapter 1 book! It's going to be a pretty straight forward campaign where you can add original sketches to your books and such. :) But if you have any suggestions to extra materials, I am all ears! This is what the Chapter 1 book looked like. The Chapter 2 book will be printed in the same format. When I was at New York Comic Con last year, I bought this lovely scarf from Cari Corene! I have been wearing it a lot since then, and got tons of compliments on how lovely it is. I decided to post it on instagram just recently, and she replied and even did this cute little paint over on Gregg with the scarf on, so I thought I'd share it here! Anyway - make sure to check out her store! Her art is absolutely amazing, blows me away every time she posts something new! And if you are able to, stop by her table at a convention. Such a lovely person to talk to~ I think she posts about what conventions she attends to over at her tumblr or instagram. Working Full Time The Din! I know it's much to ask for, but during this time I am in need of extra support from you readers. Here's a few ways you can help me out during these months. It will also help me create the comic in the long run! Patreon - become a monthly supporter of The Din through my Patreon campaign. As little as 1 $ a month will make a difference! 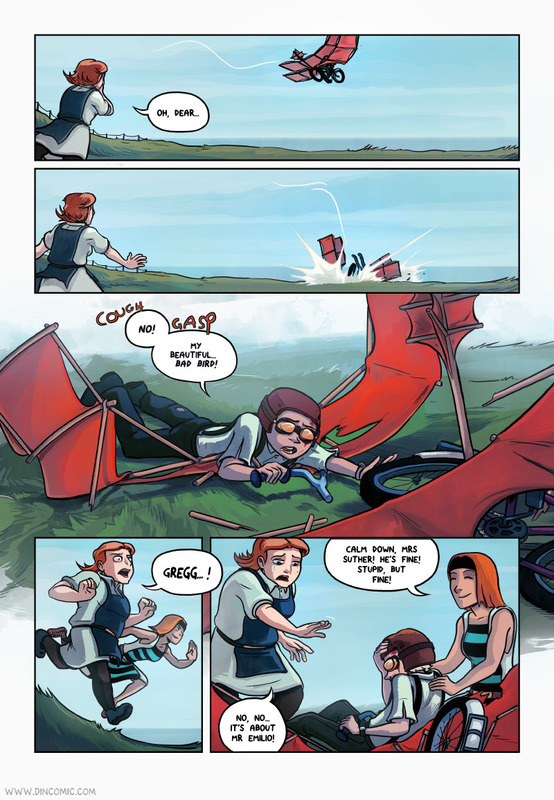 Spread the comic - more readers always help out! If you are active on twitter, tumblr and on facebook, you can help out by spreading my update announcements for example. 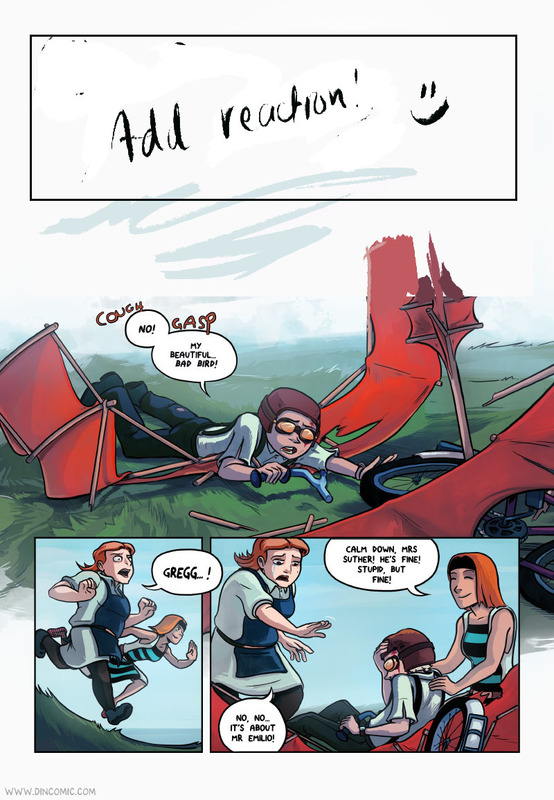 Vote for the comic - vote for The Din over at www.topwebcomics.com daily, and you will help me out reaching new readers. Guest Comic for The Lost Oracle! Hello everyone! 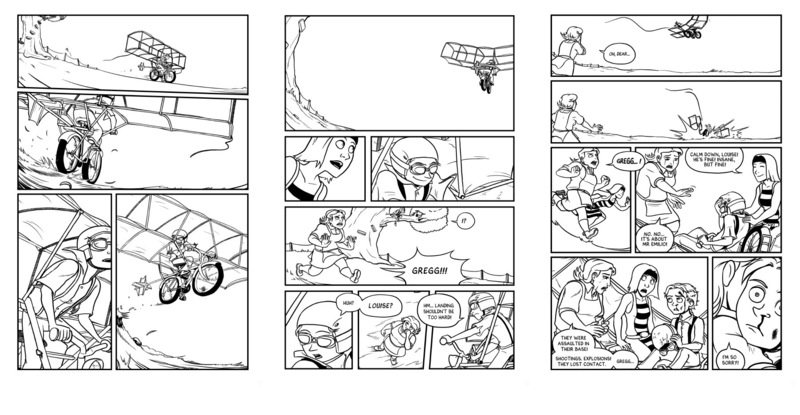 Here's some extra comic stuff this week! Everyone, go read The Lost Oracle! 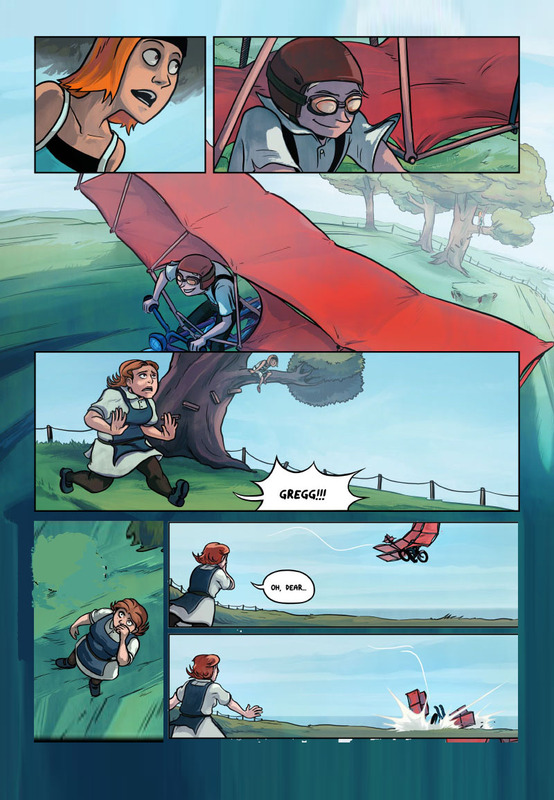 It's great and it's also available on tapastic! 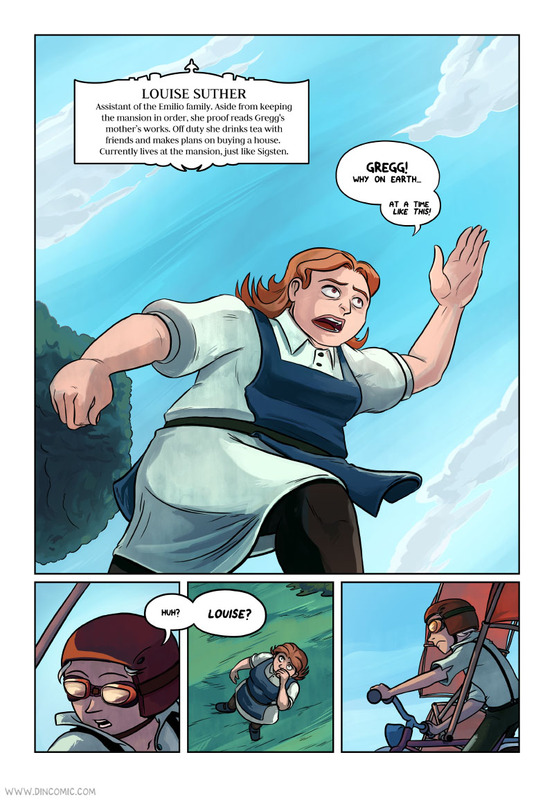 Here's my guest comic page. Enjoy!